Size	Mens Case Material	Stainless Steel Dial Color	Silver Bracelet/Strap	Alligator/Crocodile Leather Brown Clasp Type	Tang Buckle Movement	Automatic Chronograph Screw Down Crown	No Crystal	Scratch Resistant Sapphire Case Back	Solid Water Resistant	30m/99ft Case Diameter	42mm Case Thickness	13.5mm This watch features: Polished stainless steel case. Silvered dial. Polished steel applied index & roman numeral hour markers. Minutes/seconds/fractions of seconds track indexes printed in black, with 5 minute increments printed in Arabic Numerals. Polished steel hands. Elegant leaf shaped hour & minutes hands. Chronograph/Stopwatch functions: Large central seconds counter. 30 minute sub-dial counter located at the 12 o'clock position. 12 hour sub-dial counter located at the 6 o'clock position. Regular running seconds hand sub-dial located at the 9 o'clock position. Sub-dial perimeters are slightly recessed with a fine concentric guilloche texture, Chronograph sub-dials also have a very thin polished steel rim on the outer edge. Day & Date window displayed at the 3 o'clock position. IWC calibre 79320, contains 25 jewels & beats at 28,800 vph & has an approximate power reserve of 44 hours. 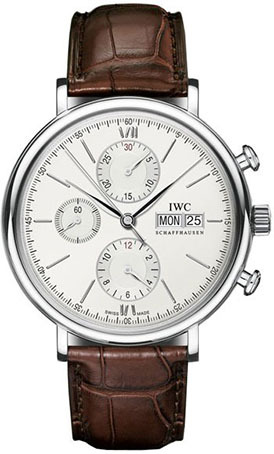 Есть вопросы по IWC Portofino Chronograph IW391007?